You’ve always dreamed of a romantic wedding in a rustic locale; he wants something a little more downtown-cool. 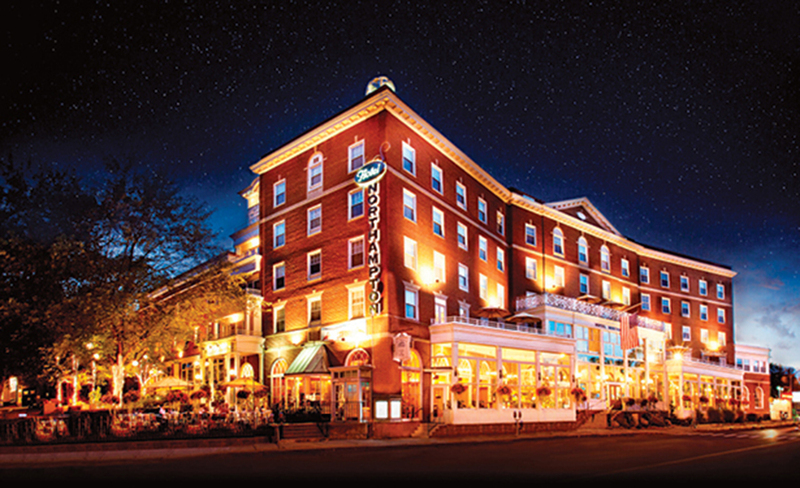 Less than two hours west of Boston, the Pioneer Valley’s pastoral vistas, charming college towns, and lively arts scene offer the best of both worlds. “You can find anything you want in this area.…barns, estates, and ballrooms,” says planner Mary Ann Dennis, owner of South Hadley–based All Events Realized. To truly maximize the local scenery, host an al fresco fete at the Log Cabin’s Upper Vista, in Holyoke, where you can get married on a lush knoll with sweeping views of the valley. Just a few steps away, a stone patio—sheltered by a flowing white tent with twinkling bistro lights—is the perfect platform for dinner and dancing. Interested in an outdoor affair with a little extra insurance against the elements? Consider Whately’s Quonquont Farm, home to fruit orchards, idyllic hay meadows, and a restored 19th-century barn for receptions. 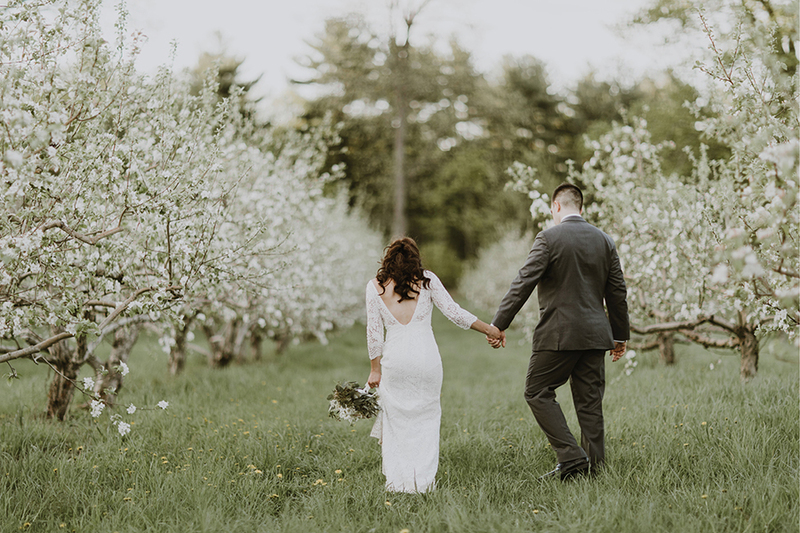 Plan a serene ceremony among the apple trees before mingling with loved ones in the rustically elegant post-and-beam event space. Those familiar with the Pioneer Valley’s manufacturing roots, meanwhile, will appreciate the recently opened Boylston Rooms, located on the shores of Lower Mill Pond in the city of Easthampton. With hardwood floors, white-painted brick walls, and high ceilings, the two industrial-chic function rooms—housed within a renovated textile mill—are blank canvases to make all your own. 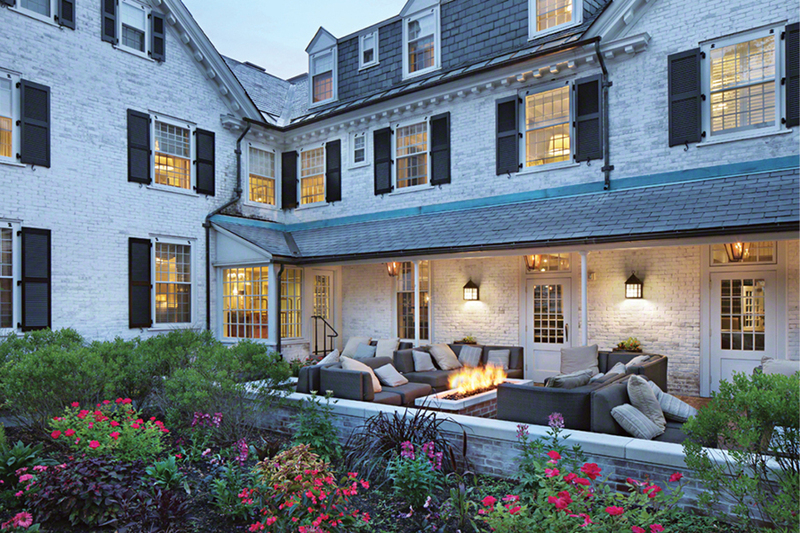 First opened more than 90 years ago, the quaint Lord Jeffery Inn charms with an on-site farm-to-table restaurant, gas fireplaces in some rooms, and a sprawling rooftop terrace overlooking the inn’s scenic grounds. Everyone feels a little nervous before the big day. For a different kind of adrenaline rush, gather your most daring friends and family for Zoar Outdoor’s zipline canopy tour: a three-hour guided excursion that includes hiking, rappelling, and—of course—flying through the trees. 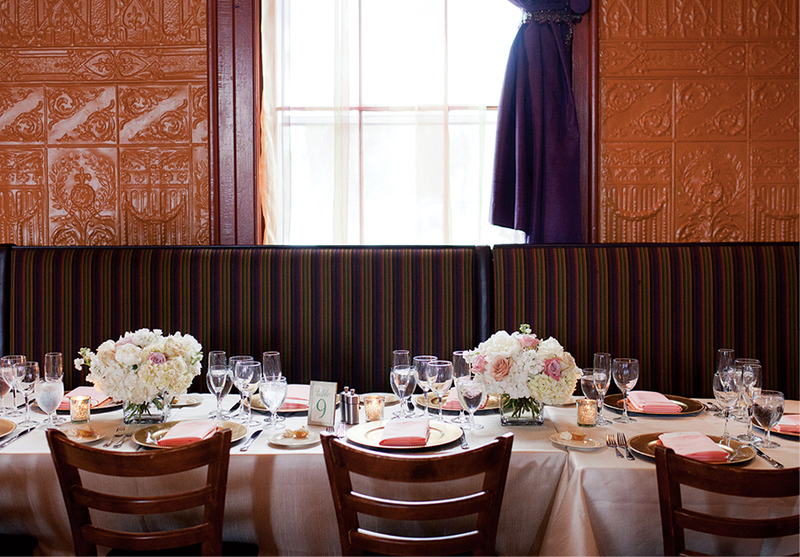 Celebrate a successful wedding run-through at the homey Blue Heron, where you’ll dig into grilled cheese tartines, arancini, Faroe Island salmon, and other globally inspired dishes from the comfort of a private dining room complete with hardwood floors and oversize windows. There’s nothing like four hours of open bar to bring on the post-dinner munchies. Help partygoers satisfy their cravings with snacks from Wheelhouse, which relies on hyper-local, farm-fresh ingredients to make mouthwatering tacos (think: beef barbacoa with pickled jalapeño aioli) and side dishes served from a photogenic food truck. Show your guests some appreciation with caramel-dipped apples—packaged in elegant window boxes or clear bags with raffia ribbon—from Amherst’s Atkins Farms, which has been growing the ruby-hued fruit since 1887. When the last song has played and the champagne has run dry, retire to the historical Hotel Northampton, where soft terry robes and whirlpool tubs await. In the morning, fuel up on savory eggs Bennie or blueberry pancakes at the hotel café before embarking on a rafting expedition with Crab Apple Whitewater, in Charlemont. 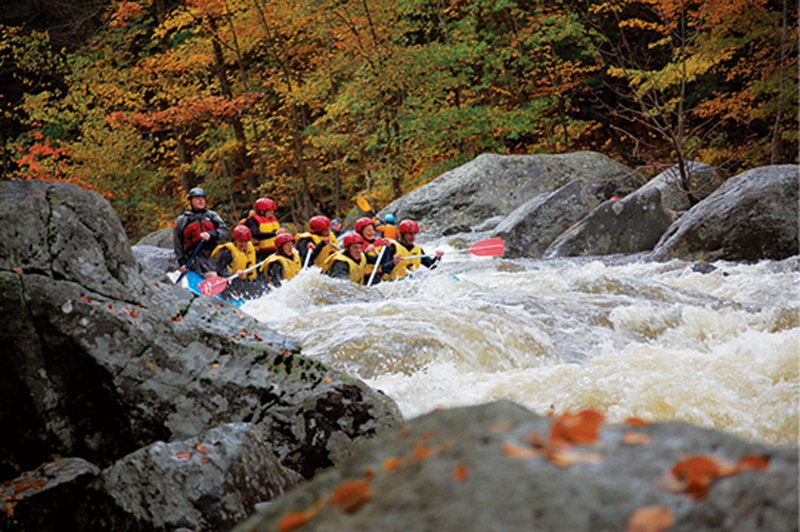 The company’s experienced guides will lead you on an exhilarating 10-mile trip along the Deerfield River, where you’ll navigate mild rapids while taking in views of the Berkshires. When you’ve had your fill of the great outdoors, head back to Northampton for a casual dinner at the recently opened Belly of the Beast, a cozy spot for recounting the day’s adventures over eclectic comfort food (cold soba noodles with peanut sauce, house-smoked-pastrami sandwiches) and local brews.